JURASSIC WORLD (2015). Director: Colin Trevorrow. Cinematographer: John Schwartzman. As I mentioned in an earlier article, it neither seems possible nor right that over two decades have passed since the original JURASSIC PARK. Spielberg’s classic offered a sense of wow and wonder we had not seen before. Plot holes were easily forgiven thanks to an otherwise tight and fascinating storyline that was coupled with new and exciting technology. I saw the film three times in the theater and I still recall each time I heard the approaching footfalls of the T-Rex that crescendoed into a roar that went straight to my bones. 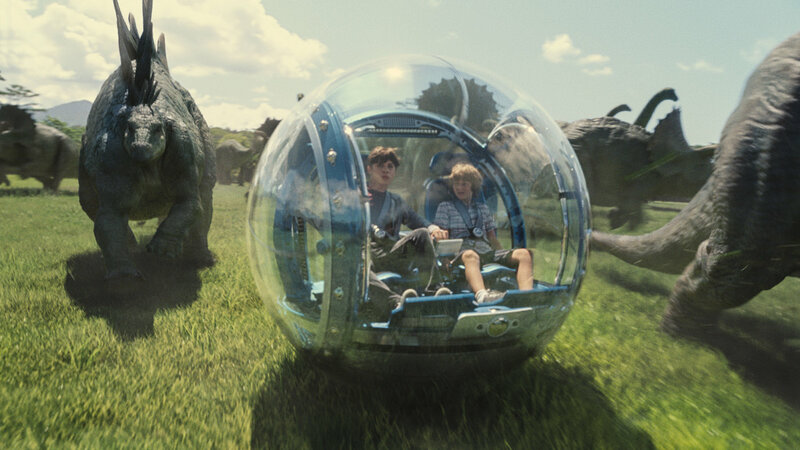 The makers of JURASSIC WORLD try to reinvigorate that same sense of awe. To put it bluntly, that is an unachievable goal. The reason is twofold: 1. No one is going to be “wowed” by the fourth installment of a franchise with a previously established rhythm. 2. The technology that was so incredible in 1993 has become so ubiquitous that even the biggest, baddest dinos seem like standard operating procedure. The people behind this film seem to be aware of this and instead of simply giving into it they openly comment on it throughout the new film. And though actual movie magic might not be on the table, director Colin Trevorrow does have a few tricks up his sleeve. It is not necessary to ignore the events of THE LOST WORLD or JURASSIC PARK III when viewing this latest installment, but the film makes a little bit more sense if you do. In fact, it helps if you ignore the last scenes of the first film as well. By the end of the first film, there was a sense that John Hammond had realized the error of his ways and would abandon any plans for a dinosaur park. But a couple decades have passed since then and a lot of money has changed hands. Hence, the rechristened Jurassic World is not only open to the public, it’s been operational long enough for InGen to frantically pursue the next big thing. Simon Masrani (Irrfan Khan) is the new man in charge and he retains a lot of Hammond’s spirit. While he is concerned with company affairs, he also shamelessly spreads the cash around and wants to care for both the guests of the park and the dinosaurs themselves. 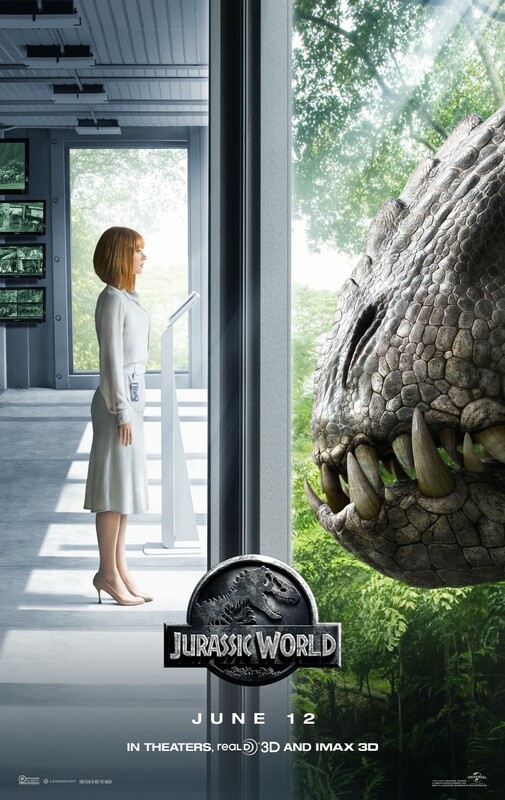 Masrani naturally has a lot of things stirring at once so he trusts the day-to-day operation of Jurassic World to his trusted employee Claire Dearing (Bryce Dallas Howard), a super-organized, control oriented career woman who tries somewhat unsuccessfully to juggle her responsibilities without becoming a corporate robot. Claire’s attention to her work has not left her with much time for outside relationships, something that comes to light when she is asked to watch over her nephews as their parents send them on a vacation to the resort. The younger child, Gray (Ty Simpkins) is enthusiastic and awed by the amazing creatures on display at Jurassic World. But unlike his older brother, he is more aware and concerned with the real reasons their parents wanted to send them away for a few days. Zach (Nick Robinson) is the older of the two and being a teenager is the character you want to shake the most. He spends most of his time staring at his phone and acting like nothing impresses him. He may not be a rocket scientist, but he is aware that he possesses teenage good looks. Hence, he’s reluctant to commit to his doting girlfriend back home and spends most of the time staring at and flirting with any girl that crosses his line of sight. In a film full of creatures that hunt and kill due to a biological imperative, it’s an interesting and somewhat disturbing contrast to note how Zach’s own predatory behavior is viewed as natural and even a bit cute. He’s discovering a new power within himself, but he is too immature to know what to do with it. Like many teenagers he seems mostly interested in his own feelings and doesn’t pay much attention to the effect it might have on others. And then we have Owen Grady (Chris Pratt), our de facto hero. He has managed to train a quartet of velociraptors to follow his instructions. Though he has imprinted himself on the raptors, Owen is well aware they remain dangerous creatures even in the presence of their alpha. As a protagonist, Owen is a throwback and with that comes good and bad attributes. Mostly, his character works. He’s a man of the world who was plucked right from an old-fashioned serial. He is one of the only people who has the right instincts and comes off as someone who was plucked from an old serial. But the character is total swagger and dangerously full of himself. This is fine. I don’t need my protagonists to be perfect specimens when it comes to virtue or behavior. Half the time I was impressed with this old-fashioned hero. But in the other half, I was reminded of Johnny Karate, the ridiculous alter ego of Pratt’s own PARKS AND REACTION character. An early scene between him and Claire (which was released to the public a couple months before JURASSIC WORLD’s release) has him flirting in a way that Owen believes to be cute, but it’s actually pretty obnoxious. The main conflict of the film comes in InGen’s newest project. Even though one would expect the miracle of bringing dinosaurs back after tens of millions of years should be enough to satiate audiences, the consumerist world doesn’t really work like that. Everything has been focused grouped and analyzed so much that new trends seem to pop up weekly. And even in a world of dinosaurs, InGen is convinced that patrons want something new. Hence, they have created a hybrid dinosaur and called it Indominus Rex (One can only imagine the long list of rejected names during the planning stages. I imagine the word “extreme” popped up regularly.). The exact species of dinosaur, as well as the animals used to complete their spotty DNA strands, are being kept secret however. So when the creature breaks out from its enclosure, even those in charge are unsure of what they’re dealing with. The Indominus Rex carves a bloody swath across the park, making his way closer and closer to the midway area where most of the guests have been evacuated. But Zach and Gray are not among those guests and are now lost in the park. As Claire and Owen frantically search for the kids, the characteristics of the Indominus Rex give them pause. The animal seems to hunt not for food but for the pure pleasure of killing. What’s more is that despite its large size, the animal can camouflage itself. But why would an animal that’s supposed to be viewed by the public include camouflage ability? There’s something not quite right about this latest dinosaur. Of course, there has been a lot that’s not quite right with all the dinosaurs we’ve seen in the franchise. Much of the science involving dinosaurs has been amended within the last twenty years, making their portrayal in the JURASSIC PARK franchise seem antiquated. Dr. Henry Wu (B.D. Wong, the only actor to return from the original) even points out that if InGen was concerned with authenticity, the dinosaurs in the park would look and sound much different. But because of the incomplete DNA strands, they couldn’t offer authenticity and no one at InGen seemed to care. They wanted dinosaurs – bigger, meaner and more impressive than the factory model. The biggest sin committed by John Hammond when he built Jurassic Park was believing he could create and then control an entire ecosystem. It is a lesson that was not learned by the people involved in the Jurassic World park. Jake Johnson (who also showed up in Trevorrow’s previous film, SAFETY NOT GUARANTEED) serves as a sort of conscience for the film by noting that these are animals and eventually they will eat those lower on the food chain. He bemoans the fact that a park that was set up with the best of intentions has become just another tourist trap, joking about all the corporate sponsors. It should also be noted that we do actually see these company logos emblazoned across the midway, suggesting that either the companies who paid for product placement in JURASSIC WORLD don’t get the joke or more likely they just don’t care. The most surprising theme tackled in JURASSIC WORLD is the fickle nature of the public. Never mind the fact that Jurassic World started out creating miracles, the people behind it are convinced they have to keep getting bigger and bigger in order to stay relevant. Well, that sounds a lot like Hollywood itself, right? Thirty years ago, the biggest budget films were the price of lower budget films today. Studios that would typically have one or two huge event films per year are now under pressure to have at least a half dozen. You can even use the JURASSIC PARK series as an example. In 1993, JURASSIC PARK was one of the biggest films of all time and in many ways, it redefined how movies were made. For better or worse, that film showed what was possible with CGI technology. And it was incredible, an absolute marvel. Forget how many giant monster movies we had seen over the years, when you saw JURASSIC PARK, you knew you had never seen anything like it before. Four years later, Spielberg made the sequel and in just that short period, people were already a little suspicious. The special effects were still impressive, but there was a general consensus that the film offered nothing new. Four years after that came JURASSIC PARK III, an enjoyable film but one that was treated as B-movie entertainment…. a B-movie that cost just south of $100 million and utilized the same technology that was considered miraculous just eight years before. Now comes JURASSIC WORLD, and it’s the biggest one yet. And it wants you to be well aware of how much they are trying to impress the audience. The people at the Jurassic World theme park have gone wildly over budget and recklessly tried to rewrite every rule in order to give the public a spectacle that will thrill and terrify their audience and the makers of the JURASSIC WORLD movie have done the same. This is a message mirrored explicitly throughout the film. It literally takes a giant sea monster doing a belly flop ten feet in front of Zach to drag him away from his phone and out into the world before his eyes. There is a subplot that involves InGen’s intention to weaponize the dinosaurs for their previously unmentioned military applications. While this subplot is essential to understanding what’s going on in JURASSIC WORLD, I groaned the moment it was brought up. One of the things I enjoyed about JURASSIC PARK III was that a stereotypical group of black ops mercenaries were introduced and then dispatched within seconds. That was refreshing precisely because even in 2001, the mercs vs. monsters trope was already getting old. ALIENS did it, PREDATOR did it, it was done. But JURASSIC WORLD pursues this plotline with gusto. Military personnel are still in the background but they are involved in the storyline. There is a strong suggestion that future sequels – and there will be future sequels, trust me – will exploit this idea even further. This is disappointing. The dinosaur project within InGen was always something done with good intentions without anyone realizing the dire consequences when things inevitably went wrong. But by engineering and weaponizing the dinosaurs, InGen becomes another Weyland-Yutani, or another Umbrella Corporation, or another Fill In the Blank. There is even a sequence in JURASSIC WORLD that directly echoes Cameron’s 1986 film. Coordinators in a control room watch as soldiers march into Indominus’ terrain. Just like in ALIENS, these soldiers are equipped with helmet cams and devices that monitor their heartrate. And just like in ALIENS, we watch as those soldiers come face to face with the dinosaur and those readouts start blinking off. The film also suffers from how it handles a couple of its characters, particularly Claire and Owen. Claire is presented as overly organized, career-oriented and thus the narrative suggests, probably frigid. There are quite a few Type A personalities out there, make no mistake. There are moments of the film that suggest Claire is merely a highly accomplished person who pushes herself hard and that her only sin is seeing the world only through her prism of control. But then there are other moments that suggest a more tired and disappointing narrative. There is a scene in which Claire is on the phone with her sister, who makes an overt suggestion that she would be happier if she settled down and had kids. Most women without kids have heard this and it rarely stops being insulting. Unfortunately, there is a strong suggestion that Claire’s sister is absolutely right. According to the film, Claire’s problem isn’t just that she doesn’t have time for anything outside her career. It’s that she needs to loosen up, settle down and follow a more traditional path. Claire is running a mutli-billion dollar operation and before this catastrophe, was doing a good job. And yet, JURASSIC WORLD translates her ability to handle this responsibility as her being a woman who is way too uptight. Where Claire sees someone in control, the film sees her as its most chaotic character and that’s a problem. Howard should be applauded for trying to retain the character’s dignity and resolve for as much as she’s allowed to. JURASSIC WORLD certainly delivers as a summer blockbuster. It’s surprising to see how easily Trevorrow transitioned to big tent pole entertainment after SAFETY NOT GUARANTEED. He has retained his ability to reveal a lot about his characters without saying too much. Claire’s introduction for instance should be studied for its use of editing, which manages to convey important information about the character before she even speaks to anyone. And when she does speak, it’s to the audience. The action is handled well, and doesn’t seem to be the generic glitchy, blurry mess we see in most blockbusters. There is a real effort to make sure everything feels real and fresh, even when what is being presented by definition is not. JURASSIC WORLD turns out to be a mostly entertaining ride, full of interesting characters and plenty of excitement. The film cannot hope to match the original because your formula is only going to be that fresh once. Still, it has managed to grab the attention of even our meme-obsessed culture for the moment. But somewhere in Hollywood, the scientists that come up with the next big thing are wringing their hands already worrying about what they can do next. Recommended.